November 19, 2016 Nefer Khepri, Ph. 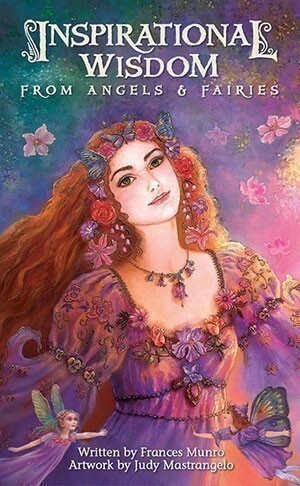 D.
Inspirational Wisdom From Angels & Fairies is a lovely oracle deck written by Frances Munro with artwork by Judy Mastrangelo, published by US Games Systems, Inc. (2016). The deck is housed in a tuck box that features elements of the images from five of the cards and is accompanied by a 57-page guidebook that has an additional 2 blank pages for notes. The cards measure 3 x 5″ and have a semi-gloss matte finish. They shuffle easily. Card backs are not reversible and reverse interpretations are not included. The guidebook is quite nice. Each card is illustrated with a small black and white detail from the overall card image at the top. Below the black and white image is a brief interpretation of the card’s meaning. Each card’s interpretation concludes with either a prayer, exercise, affirmation, or meditation to use. The cards are borderless (yay!) with the title across the center along the top of the card. Each title is rendered in white type. There is a colored border across the base of each card that is in a color that contrasts with the color scheme of the image. Each border contains a brief 2- 3 line summary of the card’s meaning. Now to see the deck in action. Card 1: I Give You Star Dreams ~ the caption reads: “Feel blessed & know that the troubles that have followed you are now far behind.” The guidebook goes on to say that I have the power to move forward by looking at the situation with a healing heart. There is also mention of being calm at bedtime. I have had issues with insomnia lately because I allow my brain to squirm like a toad. The exercise included with this card involves visualizing a deep blue night sky envelop me as it helps me to feel more mellow. I can see how that would be beneficial to me at this time. Card 2: Guardian Angel of Winter ~ the caption reads: “Your time is often taken up with problems that belong to others. Use your wisdom & the angelic energy to prioritize your own needs.” The guidebook continues to say that there is an angelic host waiting to help me to put my own needs first so I can deal with them before dealing with the needs of others. When you are a reader & a healer it’s very important to focus energy on yourself first. In that way you are better equipped to serve others. I have been forgetting this lately as I’ve become too absorbed in other people’s problems. This really hit home for me. The exercise associated with this card is to sit quietly for 5 minutes a day as I ask the angels to help me direct my energies toward my own life. Wow, what great advice & such a lovely & useful suggestion. Card 3: Doorway to Fairyland ~ the caption reads: “Imagination is the key that will open doors & show you the way.” The guidebook says that I feel the need to move forward, but cannot always see the way to go. Very true. My daughter is exerting her independence as an 18-year-old, but still lives under our roof. This card says that I need to lift my spirits and see the world from a different perspective. That tells me I need to change my point of view about the situation. I have been attempting to exert my authority, but it’s clearly time for a new approach. Also, this card speaks to me of creativity, which tells me that I need to focus more energy on my art. Perhaps through the act of being creative a new approach to the situation will come to me. I often do receive great ideas while I’m being creative. The prayer that accompanies this card is also appropriate for me at this time. The sample reading demonstrates how Inspirational Wisdom From Angels & Fairies works. The guidebook provides just a 1- and 2-card reading, but as with any oracle deck, it’s always fine to make up your own spreads. The energy of this deck is very calm, loving, and healing. The imagery is colorful without being overly bright, and the representations of the angels, fairies, and animals are truly lovely works of art. The caption on each card makes the deck very easy to use for beginners who may have never used a card deck before. You basically know the gist of the reading before you ever refer to the guidebook. The guidebook is very short and well written in a concise and straightforward manner. Personally, I do not enjoy wordy guidebooks. I like all the information provided in a neat little capsule up front & center. Frances Munro accomplishes that very well with Inspirational Wisdom From Angels & Fairies. I enjoy using this deck & highly recommend it, especially if you’re a beginning with no card reading experience. This would also make a great first deck for an intuitive child.